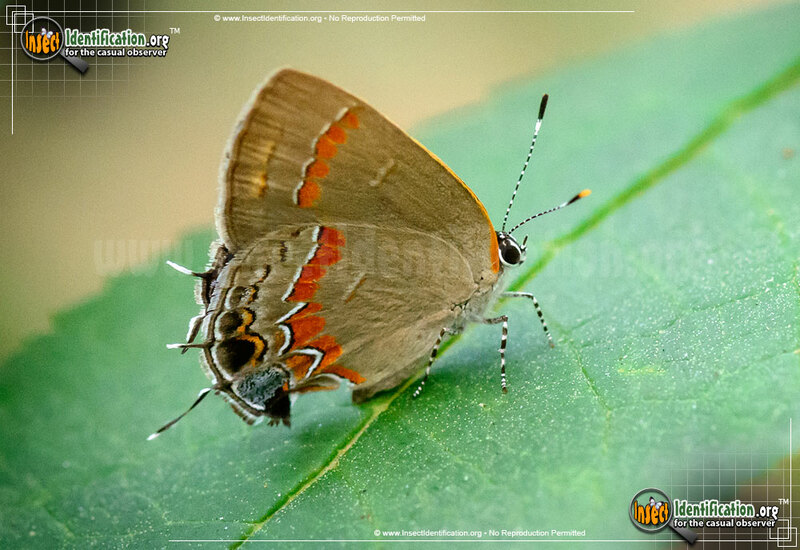 Detailing the physical features, habits, territorial reach and other identifying qualities of the Red-Banded Hairstreak Butterfly. The bold reddish-orange line of color on a taupe-colored wing offered inspiration when deciding on a common name for the Red-Banded Hairstreak Butterfly. Red-Banded Hairstreaks are fast in flight and tend to stay lower to the ground than other butterflies. When resting with wings up, the bright swish of red-orange on their wings is highlighted by the same coloring on the edge of the wing by the head. A splash of bright blue near the rear of the butterfly is also eye-catching. Males perch on branches, looking for potential mates and guarding their territory from encroachment by other insects. Females lay fertilized eggs on the leaf litter of host plants. Caterpillars eat the dead and fallen leaves off of plants like sumac, oak, and wax myrtle as well as other detritus on the forest floor. They look more like brown slugs than typical, tubular caterpillars. Two to four generations a year are common across its range. Adults drink nectar from milkweed, dogbane, yarrow, and sumac blossoms. Adults can be found in coastal areas, sandy forests, woodland edges and fields.